I only read the AI Impacts article that includes that quote, not the data to which the quote alludes. Maybe ask the author? Sushil Bikhchandani, David Hirshleifer and Ivo Welch, Information cascades, The new Palgrave dictionary of economics (Macmillan, 2018), pp. 6492-6500. Oksana Doherty, Informational cascades in financial markets: review and synthesis, Review of behavioral finance, vol. 10, no. 1 (2018), pp. 53-69. Maria Grazia Romano, Informational cascades in financial economics: a review, Giornale degli Economisti e Annali di Economia, vol. 68, no. 1 (2009), pp. 81-109. A seminal paper by Bikhchandani et al (1992) explains the conformity and fragility of mass behavior in terms of informational cascades. In a closely related paper Banerjee (1992) models optimizing agents who engage in herd behavior which results in an inefficient equilibrium. Anderson and Holt (1997) are able to induce information cascades in a laboratory setting by implementing a version of Bikhchandani et al (1992) model. The second strand of literature examines the relationship between information cascades and large fluctuations. Lee (1998) shows how failures in information aggregation in a security market under sequential trading result in market volatility. Lee advances the notion of “informational avalanches” which occurs when hidden information (e.g. quality) is revealed during an informational cascade thus reversing the direction of information cascades. The third strand explores the link between information cascades and heavy tailed distributions. Cont and Bouchaud (1998) put forward a model with random groups of imitators that gives rise to stock price variations that are heavy-tailed distributed. De Vany and Walls (1996) use a Bose-Einstein allocation model to model the box office revenue distribution in the motion picture industry. The authors describe how supply adapts dynamically to an evolving demand that is driven by an information cascade (via word-of-mouth) and show that the distribution converges to a Pareto-Lévy distribution. The ability of the Bose-Einstein allocation model to generate the Pareto size distribution of rank and revenue has been proven by Hill (1974) and Chen (1978). De Vany and Walls (1996) present empirical evidence that the size distribution of box office revenues is Pareto. Subsequent work by Walls (1997), De Vany and Walls (1999a), and Lee (1999) has verified this finding for other markets, periods and larger data sets. De Vany and Walls (1999a) show that the tail weight parameter of the Pareto-Levy distribution implies that the second moment may not be finite. Lastly, De Vany and Walls (1999b) have shown that motion picture information cascades begin as action-based, noninformative cascades, but undergo a transition to an informative cascade after enough people have seen it to exchange “word of mouth” information. At the point of transition from an uninformed to an informed cascade, there is loss of correlation and an onset of turbulence, followed by a recovery of week to week correlation among high quality movies. Information cascades does not seem to be the best choice of keywords. I wouldn't say that 'information cascades' isn't the best choice of keywords. What's happening here is that the same phenomenon is studied by different disciplines in relative isolation from each other. As a consequence, the phenomenon is discussed under different names, depending on the discipline studying it. 'Information cascades' (or, as it is sometimes spelled, 'informational cascades') is the name used in economics, while network science seems to use a variety of related expressions, such as the one you mention. Re extremizing, the recent (excellent) AI Impacts overview of good forecasting practices notes that "more recent data suggests that the successes of the extremizing algorithm during the forecasting tournament were a fluke." Here’s an insight I had about how incentives work in practice, that I’ve not seen explained in an econ textbook/course. There are at least three ways in which incentives affect behaviour: 1) via consciously motivating agents, 2) via unconsciously reinforcing certain behaviour, and 3) via selection effects. I think perhaps 2) and probably 3) are more important, but much less talked about. In this chapter, I discuss explanations of actions in terms of their objective consequences... There are two main ways in which this can happen: by reinforcement [1-2] and by selection ... If the consequences of given behavior are pleasant or rewarding, we tend to engage in it more often; if they are unpleasant or punishing it will occur less often. The underlying mechanism could simply be conscious rational choice , if we notice the pleasant or unpleasant consequences and decide to act in the future so as to repeat or avoid repeating the experience. Often, however, the reinforcement can happen without intentional choice . Any further changes since the post was published? Yet that last chapter also showcases one of the book's main failings. Thing 21's title is about the benefits of big government, but its content is only about the welfare state. I'm happy to grant that social safety nets can be beneficial for job mobility, while still strongly believing that increased regulation and state-sector employment have the exact opposite effect. I agree with this. Jason Brennan draws a useful distinction between the "social insurance state", which seeks to provide various goods and services, and the "administrative state", which seeks to regulate the economy. Since these two functions of the state are clearly very different, it makes little sense to frame the discussion as one where one should be either for or against "big government". Reason: A superbly clear overview of the history of economics, from Adam Smith until the 1970s. Each chapter provides a guide to further reading. I found this book much better than the alternatives in the genre that I consulted, including Lionel Robbins' opinionated A History of Economic Thought and Joseph Schumpeter's chaotic History of Economic Analysis. As a companion, I recommend Keynes' Essays in Biography, a collection of wonderfully written (and astonishingly well-researched) essays on some of the great English economists, including Malthus, Jevons, Edgeworth and Marshall. Thanks for the feedback. I agree that a comment worded in the manner you suggest would have communicated my point more effectively. My point is that these early pronouncements are (limited) evidence that we should treat Eliezer's predictions with more caution that we would otherwise. Eliezer has not published a detailed explanation of his estimates, although he has published many of his arguments for his estimates. My current estimate, as of right now, is that humanity has no more than a 30% chance of making it, probably less. The most realistic estimate for a seed AI transcendence is 2020; nanowar, before 2015. I believe the books realitygrill is referring to are instead Mankiw's Principles of Microeconomics and Case & Fair's Principles of Microeconomics, since McAfee's is a microeconomics (not a macroeconomics) textbook. it's much easier to affect the near future than the far future, so let e represent the amount of extra "entropy" that our actions face if they target the far future. For example, e = 10^-6 says there's a factor-of-a-million discount for how likely our actions are to actually make the difference we intend for the far future vs. if we had acted to affect the near-term. In the past, when I expressed worries about the difficulties associated to far-future meme-spreading, which you favor as an alternative to extinction-risk reduction, you said you thought there was a significant chance of a singleton-dominated future. Such a singleton, you argued, would provide the necessary causal stability for targeted meme-spreading to successfully influence our distant descendants. But now you seem to be implying that, other things equal, far-future meme-spreading is several orders of magnitude less likely to succeed than short-term interventions (including interventions aimed at reducing near-term risk of extinction, which plausibly represents a significant fraction of total extinction risk). I find these two views hard to reconcile. Ah, I thought I had searched Libgen but it seems I didn't. Thanks! Landes, Joan B., The Public and the Private Sphere: A Feminist Reconsideration, in Joan B. Landes (ed. ), Feminism, the Public and the Private, New York: Oxford University Press, 1998, ch. 5. On IQ, I strongly recommend Ian Deary's Intelligence: A Short Introduction (link to shared file in my Google Drive). A prima facie argument in favour of the efficacy of prayer is […] to be drawn from the very general use of it. The greater part of mankind, during all the historic ages, has been accustomed to pray for temporal advantages. How vain, it may be urged, must be the reasoning that ventures to oppose this mighty consensus of belief! Not so. The argument of universality either proves too much, or else it is suicidal. It either compels us to admit that the prayers of Pagans, of Fetish worshippers and of Buddhists who turn praying wheels, are recompensed in the same way as those of orthodox believers; or else the general consensus proves that it has no better foundation than the universal tendency of man to gross credulity. It might be that you haven't used CS enough to internalize the ethos governing host-guest relationships. I don't think CS hosts generally frame their decision to host someone as providing a favor to this person; rather, this is something they do because they genuinely enjoy it. Speaking for myself, I only expect my guests to be considerate (make little noise, be clean, etc., and show kindness in our interactions). As long as this minimal expectation is met, I take them to be under no obligation towards me. For what it's worth, I never got into the habit of using Anki until I installed the mobile app on my smartphone. This happened about three years ago, and since then I've been using it on a daily basis, primarily during commutes. If your experience is limited to the web or desktop versions, do consider giving the mobile app a try. I think the problems associated with providing concrete political examples are in this case mitigated by the author's decision to criticize people on opposite sides of the political debate (Soviet communists and hysterical anti-communists), and by the author's admission that his former political beliefs were mistaken to a certain degree. Because it is often easy to detect the operation of motivated belief formation in others, we tend to disbelieve the conclusions reached in this way, without pausing to see whether the evidence might in fact justify them. Until around 1990 I believed, with most of my friends, that on a scale of evil from 0 to 10 (the worst), Communism scored around 7 or 8. Since the recent revelations I believe that 10 is the appropriate number. The reason for my misperception of the evidence was not an idealistic belief that Communism was a worthy ideal that had been betrayed by actual Communists. In that case, I would simply have been victim of wishful thinking or self-deception. Rather, I was misled by the hysterical character of those who claimed all along that Communism scored 10. My ignorance of their claims was not entirely irrational. On average, it makes sense to discount the claims of the manifestly hysterical. Yet even hysterics can be right, albeit for the wrong reasons. Because I sensed and still believe that many of these fierce anti-Communists would have said the same regardless of the evidence, I could not believe that what they said did in fact correspond to the evidence. I made the mistake of thinking of them as a clock that is always one hour late rather than as a broken clock that shows the right time twice a day. Thanks anyway. Someone else managed to get me a copy (he contacted me privately). Carlos Santiago Nino, Some confusions around Kelsen’s concept of validity, Archiv für Rechts- und Sozialphilosophie, vol. 64, no. 3, pp. 357-377. It's available on Jstor, but although my university subscription usually allows me to download papers from that database, I don't seem to have access to this particular one. If anyone can get it for me, I'd be very grateful. A passion to make the world a better place is a fine reason to study social psychology. Sometimes, however, researchers let their ideals or their political beliefs cloud their judgment, such as in how they interpret their research findings. Social psychology can only be a science if it puts the pursuit of truth above all other goals. When researchers focus on a topic that is politically charged, such as race relations or whether divorce is bad for children, it is important to be extra careful in making sure that all views (perhaps especially disagreeable ones, or ones that go against established prejudices) are considered and that the conclusions from research are truly warranted. I tried quite a few; my favorite two are ManicTime and RescueTime. Why should we consider possible rather than actual experiences in this context? It seems that cryonics patients who are successfully revived will retain their original reward circuitry, so I don't see why we should expect their best possible experiences to be as good as their worst possible experiences are bad, given that this is not the case for current humans. 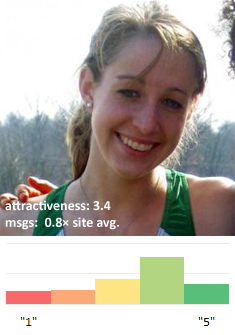 Christian Rudder from OkTrends (OkCupid's blog) found that the shape of the distribution of male attractiveness ratings varied significantly across female ratees. Did you observe a similar phenomenon? I may or may not have gone into the yard, made a fire, and slowly fed $100 into the flames while concentrating on how money is useless if you don't use it. Nick Winter implies that he burned $100 (!) to impress on him the idea that money is useless if not used. There are innumerable indicators of epistemic superiority in addition to physical or temporal location, and some of these are arguably more reliable. I'm skeptical that the topics that your society regards as "controversial" will coincide with those that you'd be warranted in suspending judgment about in deference to your epistemic superiors. For myself, I generally try not to have an opinion on almost any controversial issue. Many issues that are now relatively uncontroversial where once controversial, or are still controversial in other parts of the world. Do you also suspend judgment about such issues? Is your reference class the roughly 100 billion people that have ever lived? I think that polyamory - multiple consenting partners - is a relationship style that can work well for some people in some life situations. If you want to prioritize freedom (keep your contracts minimal and short), variety (of personalities you interplay with), or exploration of types of partnerships, it might make sense. However, if you wish to prioritize true love (depth of intimacy with a hopefully forever partner) or a stable family, I think polyamory is a style which is at best deeply challenging and at worst fundamentally opposed to those goals. So I want couples with these priorities who are considering polyamory to make sure they aren't ignoring the tradeoffs in a setting where the cost of failure is significantly more than a broken heart. Maybe read a good book that teaches you how to acquire some valuable skill, e.g., Steel's The procrastination equation (summary), Carnegie's How to win friends and influence people, or Young's The little book of productivity (summary). If you are a Duolingo user, you can use their metrics (levels completed, total points, length of streak, percent of text readable, etc.). In case it is of help to anyone, I wrote a summary of Kaufman's book. For an introductory course on statistics (which uses the OpenIntro Statistics textbook), I strongly recommend Coursera's Data Analysis and Statistical Inference. Before I found this course, I tried Coursera's Statistics One and Udacity's Intro to Statistics, neither of which I recommend. Did you manage to research this issue further? I'm curious. [link] "The Survival of Humanity"
[Link] Tomasik's "Quantify with Care"
[Link] TEDx talk of Anders Sandberg on the Fermi "paradox"
[Link] One in five American adults say they are atheist, agnostic or "nothing in particular"